Welcome to Callaghan Country! 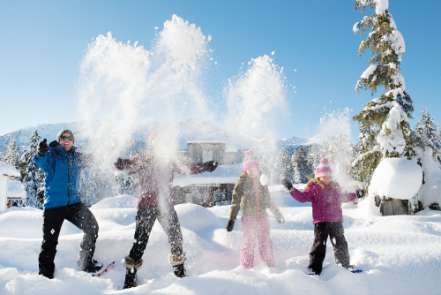 We are located in the heart of British Columbia’s Coast Mountain Range, just 20 minutes south from Whistler Village and 1.5 hours north of Vancouver. Our operational season runs from mid-November to mid-April. We are currently taking Reservations for Winter 2019/20. Starting in early October and sticking around until late May, this place receives an annual snowfall of 36 feet (1,097cm) and boasts an average annual snowpack of 12 feet (365cm), giving it a reputation as one of the wildest snow playgrounds in the Pacific Northwest. Our tag line isn’t “Routes of Wilderness” for nothing! 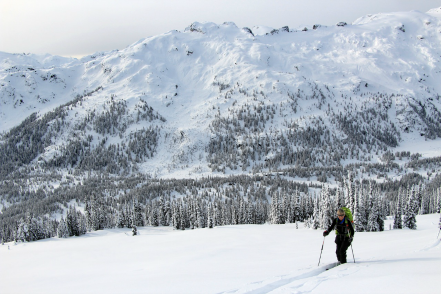 Callaghan Country is the wild and wooly side of the SKI CALLAGHAN experience. Our product is less polished, more informal and built with the intent to reconnect you to the natural world. 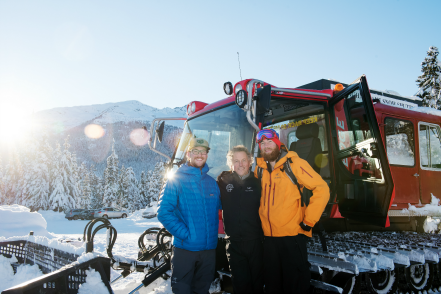 Part of that experience may include terrain, features or conditions that differ from those offered at our sister facility Whistler Olympic Park. Our trail network is designed to put the cross country back into XC skiing and our destination trail heads are guaranteed to inspire, enrich and challenge your everyday perception. We're going to take you outside the circuits for a broader mountain experience akin to hiking. 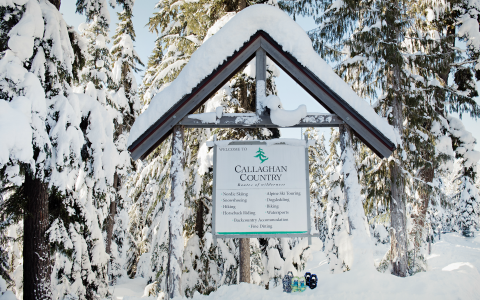 Callaghan Country's feature experience is an overnight adventure to Journeyman Lodge. Journeyman Lodge retains the charm and warmth of traditional alpine culture. Guests eat together and relax together. They share tales and connect with like-minded people who’ve each just had their own best day ever. Humans have been sitting around a fire telling stories since the beginning of time. Why stop now? Witness awe-inspiring mountain vistas, explore untouched wilderness, and relax in the comfort and safety of our charming full-service backcountry lodge. It's a West Coast Must-Do! Only a 90 minute drive from downtown Vancouver (about 25 minutes from Whistler) brings you to our base facilities known as the Alexander Falls Touring Centre. 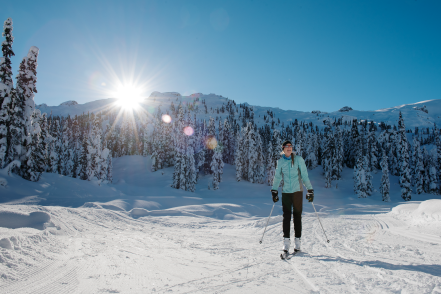 The purchase of an admission ticket upon entry will provide you free parking and full access to over 90km of the Ski Callaghan Nordic trail network ideal for recreation and nature pursuits on snowshoe, classic cross-country ski, and skate ski. 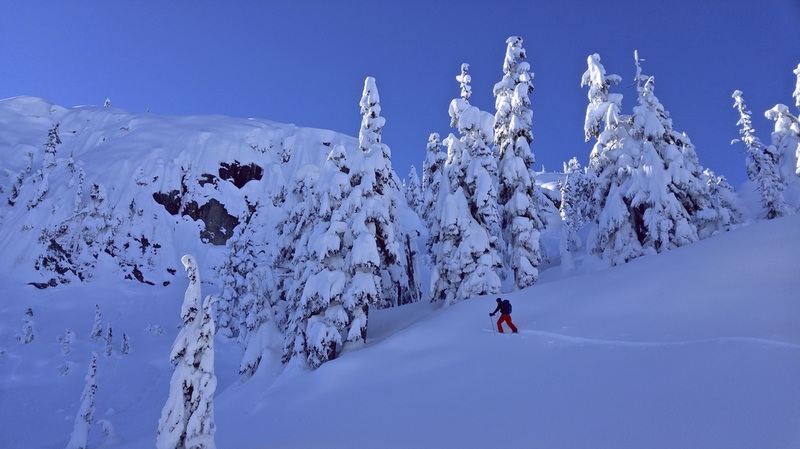 Journeyman Lodge is a reservations based mountain Inn (more commonly known as a backcountry lodge) offering a range of accommodation suited to every adventurer’s budget. We also offer flexibility in length of stay and choice of guided or unguided activities. Hand-built in 1978 by original members of Whistler’s backcountry community, Callaghan Country is the passion project of a few 'tenacious' mountain loving individuals. This love for mountains and the great outdoors is alive and well today with a tiny staff of 8, working tirelessly to share this place with genuine services that truly connect our guests with the quintessential magic that is 'Callaghan Country'. From our knowledgeable and engaging adventure agents, gear reps, lodge hosts, and volunteers, you can expect friendly, personalized service at Callaghan Country. It is our attention to value, our commitment to authenticity, and our distinct “local flavour” that guarantees a memorable and unique life experience to each and every guest.